We can’t count on Republicans or Democrats to save us. Instead, we are the ones to build the world we want, starting in our communities. It’s the darkest time of year in the Northern Hemisphere. I awaken in the dark and check for news about Standing Rock and about the Trump transition. It’s almost an epic pairing: the Native Americans, withstanding water cannons and pepper spray, camped out in below-zero blizzards, holding as sacred the water, land, and well-being of the children—and the president-elect, in his gold-gilded tower named after himself, selects his team of leaders, mainly White men who are remarkable not for their accomplishments or wisdom, but for their contempt for those who are not rich and White, their love for fossil fuels and Russian oligarchs, and their reckless dismissal of science and the impending climate catastrophe. It would be a mistake to oversimplify this as a conflict between good and evil. Still, the ethical beacon of light shining from the remote plains of North Dakota is very much needed. It is a very dark time. Trump’s error-prone, genital-groping buffoonery is loved by TV. But his choice of a team makes clear that the agenda is dead serious. So what do we do now, as the solstice is here and the light begins to return? What are we to do as we face Inauguration Day and day after day of a Trump presidency? This is far from a popular mandate, and that bears much repeating. It won’t stop a figure like Trump, though. What can help is if we refuse to collaborate with his authoritarian excesses. The witch hunts of the McCarthy era, the Maoist purges in China, the Holocaust—none of these could have happened without ordinary people who either cooperated or raised no objection. Our first task, then, is to get ready to resist in ways small and quiet, and large and loud. We’ve already seen one encouraging example: Department of Energy officials declined to release the names, requested by the Trump transition team, of those who have been working on climate change issues. The names, many feared, would be used to conduct a purge of those not adhering to the climate-denying ideology of the incoming administration. We know resistance works. Black Lives Matter has prompted some reassessment of policing throughout the country. Tribes, ranchers, climate hawks, and community activists have shut down tar sands pipelines and coal terminals. And Occupy forced the topic of gross inequality onto the political agenda, and helped set the stage for the Bernie revolution. To make it through, we need other people. Isolation is toxic, even during good times. So reach out to people who make you feel supported and to those who are most vulnerable. There is much discussion about reaching out to Trump voters. Deep listening across these political divides is important, but that doesn’t mean discounting our own values and experiences. We don’t have to cover up our shock and dismay; being vulnerable, showing our sadness and fears as well as our hopes, can be more powerful than an argument. Authentic sharing of experiences, hopes, and despair may even help us see how we can move forward together, even though the divides run deep. Much of the progress in the coming years will happen locally—in cities and neighborhoods, and sometimes statewide. Cities are locally accountable and far less gridlocked by partisanship, and they have some latitude to get things done, even with a hostile federal government. City leaders understand the need for living wages, they value their immigrant populations, and they see firsthand the impacts of climate change. Change is still possible in our communities. We can’t count on status quo Republicans or Democrats to save us. Both parties were too embedded in a system reliant on the power of corporations and Wall Street—just as Donald Trump is—and that system is killing the environment, supercharging the military-industrial complex, marginalizing people of color, and creating massive disparities of wealth. Instead, we are the ones to build the world we want, starting in our communities. We can build democracy, inclusion, love, new sources of energy, and locally rooted economies. And doing so will feed our souls and build relationships that sustain us. The work is ours to make the revolution where we live. Originally published at http://www.yesmagazine.org. Sarah van Gelder, co-founder and editor-at-large of YES! 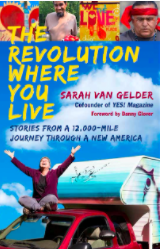 Magazine, explores the themes of locally based power in her soon-to-be released book, The Revolution Where You Live: Stories from a 12,000 Mile Journey Through a New America, available now at YES! Magazine, and in January at your local bookstore. I just made a donation to YES and have been a subscriber since the beginning, and look forward to your book as my gift. I am just a peripheral person at 83, having only gotten political since Bernie Sanders caught my attention. Previously, I was a weaver for 30+ years.